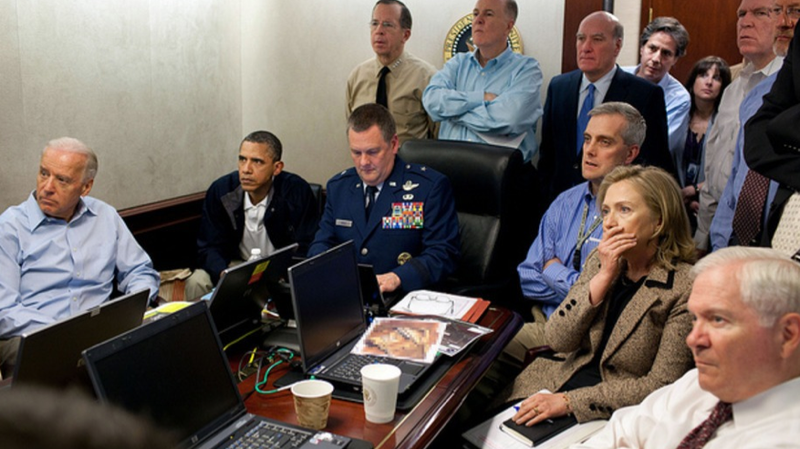 The iconic photo from the night of May 1, 2011, showed President Obama and his national security team intently watching a video feed of the raid that killed Osama bin Laden. But as the president has previously disclosed, there were also "big chunks of time" where he and his team were "just waiting." Now, according to Mr. Obama's former longtime personal aide, it turns out the president passed some of the time that night playing cards. "Most people were like down in the Situation Room and [Mr. Obama] was like, 'I'm not going to be down there, I can't watch this entire thing,'" Reggie Love said at a forum at UCLA last month. "We must have played 15 hands, 15 games of spades," Love added. Love, who left the White House later in 2011, explained that "it was a very long day" and added that he, Mr. Obama, Marvin Nicholson - another Obama aide - and White House photographer Pete Souza spent some time in the private dining room playing cards to break the tension. Love's revelation is a new detail in how that night unfolded. But the president himself, in his recollection shortly after the raid, had already revealed there was plenty of down time as the raid was happening. In a May 2011 interview with CBS' "60 Minutes" days after the raid, the president told Steve Kroft that the mood in the Situation Room that night was "tense" but added, "there were big chunks of time in which all we were doin' was just waiting." "And it was the longest 40 minutes of my life... It was a very tense situation," Mr. Obama said.